Enriched with years of experience, we are engaged in manufacturing and supplying a wide range of Mild Steel Silos. We use optimum quality stainless steel in fabrication of these silos, which are procured from authentic and honest dealers of the industry. 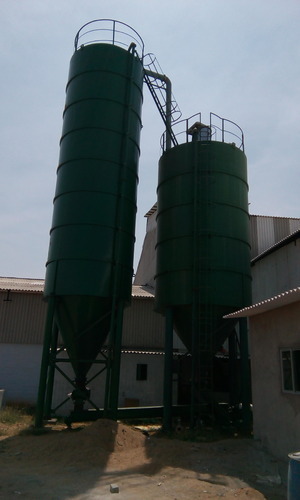 Available in varied sizes these silos are highly acclaimed for their easy installation, robust structure, long functional life, abrasion resistant, compact designs and high strength. We are one of the leading Manufacturers, Exporters and Suppliers of a premium quality range of Industrial Products. Further, we also provide Cement Plant Consultancy Services. Our product and service range comprises Bag Filter, Cyclone Separator, Dynamic Separator, Flash Driers, Flap Valves, Hoppers, Flash Coolers and Cement Plant Consultancy Services. These products are manufactured by our experienced professionals using high grade raw material in compliance with international quality standards. We are backed by a well established manufacturing unit and a team of highly skilled professionals that enable us to provide our valuable clients a fine range of products. Our product range is readily accepted in the market worldwide owing to features like Positive belt guiding system, low noise, less logistics cost, maintenance-free and removable lids with clamping devices. The quality controllers of our team examine the entire product range on different parameters to eradicate all the flaws and make the assortment defect free.